When looking for the best handgun cleaning kit we wanted try to take everything into account. We look at the style of the case, the quality of the brushes, the design of the cleaning rod and much more. If you’re looking for a 9mm gun cleaning kit it’s not going to be a big kit and that’s good. Most of these handgun gun cleaning kits are small enough to fit into your pocket. Always take into account what you’re going to be using your handgun cleaning kit for before you buy one. Many people buy a kit only to find out that it doesn’t fit their gun. We’re here to help you prevent that mistake and we list all the calibers on here that each kit works for. Be sure to double-check on the actual product page as well. Otis has a reputation for making the best handgun cleaning kit. I purchased this kit a couple of years ago and it’s held up very well over the years. Otis Technology makes very high quality brushes and jags but I’ve never been a big fan of their carrying bags. All the carrying bags are zipper style with reversible compartments, so I like to put all my Otis cleaning supplies in a separate gun cleaning box. This is the most popular handgun cleaning kit out there and for good reason. It doesn’t include a cleaning rod and instead uses a memory-flex cleaning rod. This is a heavy-duty piece of wire that you run down the barrel of the gun and attach the brush or other component to the end of the rod. They have several video detailing how to use their Memory-Flex® Cables and they do work very well. The one thing I can say about this kit is that’s very durable. Having owned it for a few years and it still looks new. The cable is a bit different from what most gun cleaning kits use. It acts like a bore snake and you simply run it through the barrel the same as a bore snake. It does a surprisingly good job and cleaning the barrel and I use it before and after a full clean. What can I say that’s bad about Otis? If you would rather use a gun cleaning rod then you might not like this cleaning kit. However, I was skeptical of this new design as well a few years ago but it does work remarkably well for handguns. The Calibers for this kit are limited and are pretty much only designed for a .38 and .45. You can purchase other brushes individually if you need them for a few dollars. As always, CLP and other necessary items are not included in this it. 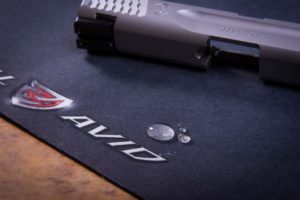 It looks like Real Avid may have come out with the best handgun cleaning kit with their Gun Boss model. We were intrigued by this cleaning rod, so I decided to by it because it’s a very reasonable price. This kit is very compact and includes 13 pieces. For such a low price I was surprised by how much you get in this kit. First, I want to say that the cleaning rod is certainly unique. It’s a two piece brass rod that has a ball bearing. It has a built in tap hammer surface for your to lightly tap with your hammer, so that you don’t damage your barrel. The grip on the handle is also very impressive, since my hands are usually covered in oil and grease they slip on the plastic cleaning rods but not so with this one. The case is really cool. It’s made of polycarbonate and is water proof and weather proof and is virtually indestructible. It has a little kickstand on it that allows you to flip it up and easily access everything inside the case. The whole case measures about 8” x 4” and weighs less than a pound. I love everything about this and I’m not using it for all of my 9mm. I thought it would be a good idea to check the negative things people are saying online since I can’t come with any. Not my surprise nobody was saying anything bad about it. The only thing that could be considered negative is that the kit is a bit basic. 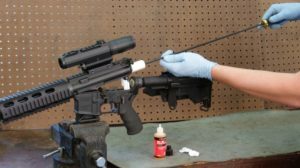 Like all gun cleaning kits you need to buy your gun cleaning solvent and cotton swabs independently. Overall, this is my favorite hand gun cleaning kit so far and very easy to use. Designed specifically to clean all Ruger handguns this 9mm gun cleaning kit is very high quality. Ruger is a very popular handgun and has over 400 variations of more than 30 different rifles, pistols, and shotguns. This cleaning kit is designed only for handguns designed by Ruger and not their only lines of firearms. The Ruger cleaning kit comes with 15 cleaning pieces, which includes three (3) Bronze brushes, 3 cleaning jags a slotted tip adapter, three bore swabs and a muzzle guard. The plastic case is a very cool design and not often will you find many handgun cleaning kits come with such a cool looking plastic gun cleaning case. The plastic tray can be removed from the case and you can store other tools inside it. It’s basically like a small tackle box. 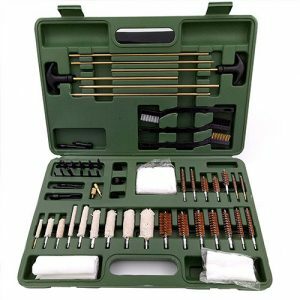 This Ruger universal kit includes 3 brushes and mops for 8 different calibers. Like many of the gun cleaning kits the cleaning rod that comes with it is not the best quality. It’s a 3 piece brass cleaning rod that doesn’t really need to be a three piece for cleaning hand guns. They probably could have added a carbon fiber 8” cleaning rod instead but oh well. The reason I really like this cleaning kit is because it comes with my favorite cleaning solvent – the Break Free CLP. If you ask me, all gun kits should include this little bottle of CLP. Most gun cleaning kits don’t have enough space to store CLP and it must be put individually somewhere else. The cleaning kit is a bit basic and I would have something like this in my glove compartment in my car as a spare. This is one that everyone should have in their bug out bag for sure! While I’m not a big fan of the idea of only having one brush in your kit, you can always buy a few more and use the carrying case. It’s a pretty cool design that comes with a plastic slot that can be taken out to store other things in it, like more brushes and cleaning pads. 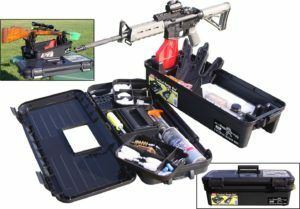 If you have several guns then a universal gun cleaning kit might be a better option. The cleaning rod is a two-piece steel rod and I would recommend replacing this one with a carbon fiber rod if you’re going to be cleaning your handguns. 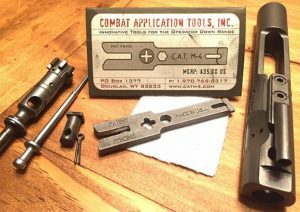 This is a very basic kit with only one brush and one scrubber, you have to choose the caliber you want when purchasing and it doesn’t offer much flexibility for other pistols. The case is pretty good but I think you can find better. My favorite thing about this kit is that it comes with a small bottle of my favorite CLP. I decided to purchase the Gun Boss Pro kit but I thought we would like at the regular Gun Boss kit to see how it differs. The first thing I like about this is the hard case. Unlike the pro model it has a sipper style case with a nylon shell. If it’s anything like the pro model then you could through this off a mountain and it wouldn’t get damaged. The cleaning rod is a traditional style two piece stationary and doesn’t swivel. This will be the one piece in this set the most people wouldn’t like, including myself. The brushes look like the standard high quality Real Avid brushes that they use in all of their kits. I own the rifle kit and if the brushes are the same as that one then they are very high quality. Quite a few complaints have been made about the cleaning rod and bushes breaking. There are a few complaints about the kit being overpriced. To be honest I would go with the Pro kit that they offer which is the same price and comes with a much better cleaning rod. Personally, I hate these styles of cleaning rods. I do like this case better however and if you’re looking for a tiny case that can fit into your pocket then this is a good option. 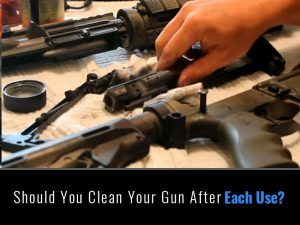 You should clean your handgun after each use. After a while this won’t become a chore and with a good kit and supplies it can be pretty fun actually. You should be inspecting every part of the disassembled handgun and read your owner’s manual closely. Watch videos on YouTube for your particular handgun to get the hang of it. 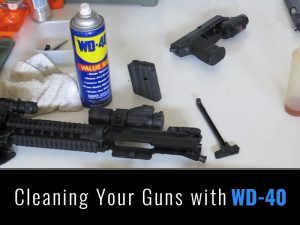 Many people, including a good friend of mine, use WD-40 as a first step in the gun cleaning process. You can let it soak on there for a few minutes and then use a wire brush to clean any gunk off. The other thing I would highly recommend for any 9mm gun cleaning kit is a good gun cleaning mat. This makes your work area look legit and while you can use an old piece of carpet or a yoga mat, a good cleaning mat will make you feel better about protecting your surfaces. It really comes down to personal preference when you’re choosing a handgun cleaning kit. We hope that we picked out the best 9mm gun cleaning kits for you. After looking at about 20 different hand gun kits it’s pretty easy to see which are the best, and all 5 of them are covered in this review. One of the biggest complaints with all the smaller 9mm kits is the cleaning rod. If you want you can always purchase a kit and buy a new carbon fiber cleaning rod and save the old rod as a backup. It’s always a good idea to have several cleaning rods, since this might be the most important component of your entire cleaning kit.